So you want StreetSideAuto discount coupons. At GetDiscountCoupon.com, you'll always find the most up to date streetsideauto.com coupon codes. All you have to do is click, copy and then just paste it in coupon box at checkout. Please Check back later to see if StreetSideAuto has offered a new coupon for you to use. $25 off orders of $350 with code Q3252011 at StreetsideAuto.com! You've found the pot of gold! Save $25 Off Orders Over $299 at StreetSideAuto.com with code LUCKY. Instant $25 Off Orders of $250+ with code WHATIWANTED25 at StreetsideAuto.com! Get $20 Off $200+ orders at StreetSideAuto.com with Code: AFQ11220! Get $30 off $300+ orders at StreetSideAuto.com with Code: AFQ11230! Get $15 off $150+ orders at StreetSideAuto.com with Code: AFQ11215! Instant $50 Off Orders Over $500 with code BIGDEAL50 only at StreetSideAuto.com! $40 off orders over $600 with code Q3402011 at StreetsideAuto.com!! Get $10 off $125+ orders at StreetSideAuto.com with Code: AFQ11210! 10% off all Putco products with code Putco2011 at StreetsideAuto.com! All New K&N Brand Products with Site-Wide Lower Pricing only at StreetSideAuto.com! Save $25 off $275 worth of Nerf Bars with code Q3nerf25 only at StreetSideAuto.com! Instant $50 Off Orders of $500+ with code WHATIWANTED50 at StreetsideAuto.com! 4th of July Sale! Save $15 off orders $150+ on floor mats/liners with code ROMANCANDLE only at StreetSideAuto.com!! Mothers Detail Bucket with everything you need for only $39.95 at StreetSideAuto.com!! 12 Days of Deals-Day 5: 12% off Yakima with code: Geese2 at StreetSideAuto! 12 Days of Deals-Day 11: Take 15% off EBC brakes at StreetSideAuto.com with code: PIPERS. Get 4 Free Truck Bed Accessories with purchase of any Tonneau Cover $175+ only at StreetSideAuto.com! Offer good while supplies last. Free ground shipping on all orders $50.00+ at StreetSideAuto.com! Some exclusions apply. 10% off all Battery Tender products with code Tend10 at StreetsideAuto.com! Get $15 with code FALL15 or a receive a $30 Gift Card when you make a purchase $249 or more at StreetSideAuto.com. Save $10 off $150 worth of Floor Mats with code Q3Mat10 only at StreetSideAuto.com! Celebrate Your Independence Sale! Save 10% off K&N Products with code SATURNMISSILE only at StreetSideAuto.com!! Instant $100 Off Orders Over $1000 with code BIGDEAL100 only at StreetSideAuto.com! 4th of July Sale! Save $35 off orders over $300 on travel accessories with code FIRECRACKER only at StreetSideAuto.com!! 12% off all Husky Floor Mats products with code Husky2011 at StreetsideAuto.com! Never miss coupons from StreetSideAuto! Enter your email below and we will send you the latest and greatest StreetSideAuto deals. 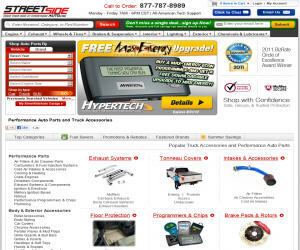 StreetSideAuto.com is dedicated to the automotive enthusiast, with direct access to the largest selection of in-stock performance parts and accessories for most cars, trucks, Jeeps and SUVs from over 900 brand name vendors. This combination allows for a unique buying experience for you, the consumer, as we only sell in-stock items, offer free shipping* on most orders, and never charge handing fees. Our expert staff and management team represent years of experience in the specialty automotive aftermarket with relationships going back as far as 30 years with some manufacturers. So what does this mean to you? It is the security of knowing that you are dealing with real hands-on all-American automotive enthusiasts, who have direct access to the manufacturers who make the parts and the experience to provide you with the right answers and best in class customer support. Once you have find the available Streetsideauto.com promo code, choose the best Streetsideauto.com code according to your needs because you can have multiple promo codes for Streetsideauto.com. You should check any restrictions and policies before applying coupon, such as expiration date, because some coupons are valid for very short period, So if you need a Latest Streetsideauto.com Promo Coupon / promotion code please BOOKMARK US (Ctrl + D) and check this site frequently. And one important thing some coupon codes are case-sensitive.